February 13, 2017, 10:35 PM · In an effort to promote the coverage of live violin performance, Violinist.com each week presents links to reviews of notable concerts and recitals around the world. 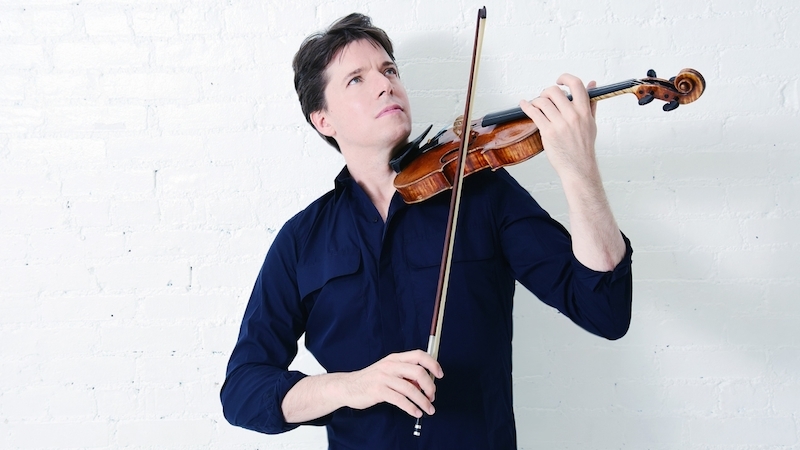 Joshua Bell performed Lalo's Symphonie Espagnole with the National Symphony Orchestra. DC Metro Theater Arts: "It’s hard to believe that Bell is 49 years-old and has a career which spans over 30 years, as he appears considerably younger, but it is evident from his dual performance as a conductor and violinist Saturday night that he is penetratingly passionate about what he does, and he adds a vibrant vitality that radiates in the usual institutional classical landscape." Leonidas Kavakos performed works by Bartok, Debussy, Janacek and Schubert in recital with pianist Yuja Wang. The Washington Post: "Minor quibbles aside, this concert was an evening of the highest-level musicmaking and was one of the grand events of the season." The San Diego Union-Tribune: "Kavakos and Wang dispensed with those difficulties and took us on a profound musical journey, from the anguished argument of the first movement to the melancholy introspection of the second, and culminating in the hair-raising fury of the last movement’s wild dance. I’ve never heard a performance so compelling and so illuminating, and the audience members who stayed were also clearly moved, judging from the whoops and standing ovation that burst out when Bartók’s musical roller coaster slammed to a halt." Nikolaj Znaider performed the Nielsen with the Cleveland Orchestra. The Plain Dealer: "His game wasn't just jaw-dropping virtuosity. It was the studious avoidance of predictability, a refusal to utter any phrase the same way twice or lead the ear in any expected direction. The result was total immersion, an episode both relentlessly gripping and utterly beguiling." Fabio Biondi performed concertos by Vivaldi and Corelli with the Chicago Symphony Orchestra. Chicago Tribune: "Biondi can be a committed iconoclast when it comes to this repertory, and while distinctly personal touches were evident Thursday, he was ever mindful of the fact that this is collaborative music. Thus he could impart his ideas to the string players without taking them too far out of their comfort zone. The result felt like a series of lively musical conversations across the centuries." Chicago Classical Review: "Biondi’s performance of the solo part was ceaselessly imaginative throughout all three concertos, at times strikingly interventionist in matters of articulation and tempo. But in certain passages, especially in RV 222, his tone turned pinched and his pitch bent flatwards. If this was intentional tonal shading, there was no indication of it from the orchestra, which did not do likewise. This incompatibility in their approaches was often apparent." Hilary Hahn performed Bruch's Violin Concerto No. 1 with the Seattle Symphony. The Seattle Times: "Hahn let the music sing, shaping the lines with power and passion, but never overdoing the vibrato or introducing any interpretive distortions. It was a masterly performance of this often-played concerto, direct and unfussy and expert." Vadim Gluzman and Philippe Quint performed works by Sarasate, Tchaikovsky and Vivaldi. The Columbus Dispatch: "Throughout the evening, utilizing violins instead of swords, Gluzman and Quint attempted to outplay each other. Alas, this reviewer must call it a draw: Gluzman and Quint were both sensitive and skillful. The only decisive winner was the audience, which was treated to an evening of sensational string music." Rachel Barton Pine performed a Baroque recital with the Los Angeles Chamber Orchestra. Violinist.com: "There was plenty more technique to behold: insanely fast and high spiccato passages; bird calls; notes too fast to quantify; double stops, fingerboard scurries, comically rapid arpeggios...all ending in an insanely high harmonic. Pine escaped the labyrinth, landed a standing ovation. It was delightful." Jennifer Koh performed works by Beethoven and Iyer, in recital with pianist Shai Wosner. The Republican: "Koh's command of color and character painted vivid drama personas through both sonatas - one moment anxious and agitated, the next coy and secretive. Some of the more outrageous ornamental excesses of the Kreutzer Sonata seemed almost too elegantly finessed - too perfect for how over-the-top they were compositionally. But that is far more a testament to Koh's virtuosity than a criticism of interpretation." Vadim Gluzman performed the Tchaikovsky Concerto with the Orpheus Chamber Orchestra. ZEALnyc: "Gluzman, the current proprietor of the very same 1690 Stradivarius (that Leopold Auer played), can no doubt give a spectacular rendition of the piece on any instrument, but these special circumstances turned this performance into something resembling a holy ritual." Ray Chen performed Bruch's Violin Concerto No. 1 with the Bamberg Symphony. South Florida Classical Review: "Chen was at his best in the concerto’s fiery, dramatic passages. He drew maximum force from the thundering chords of the opening. His big tone was gritty and powerful in melodies that took him high up the instrument’s lowest string." Finally, at last night's Grammy Awards, cellist Zuill Bailey won in the Best Classical Instrumental Solo category, over nominated violinists Leila Josefowicz, Gil Shaham and Christian Tetzlaff. Bailey won for his performance of Michael Daugherty's Tales Of Hemingway, which also won in the Best Contemporary Classical Composition and Best Classical Compendium categories. Congratulations to all.